Who “owns” the sales function in your organization? If you are a home-based business or a small start-up, the answer is clear – you do. In start-up organizations (that don’t have cash-cows behind them), the owner always “owns” the sales function. Sometimes, a business owner may partner with a sales consultant who can uncover additional opportunities, but ultimately, the sales accountability falls on the owner’s shoulders. It doesn’t matter how great your product or service is. If someone in your company isn’t connecting with buyers, you will remain a best-kept secret. In today’s economic climate, having enough feet on the street has never been more important. 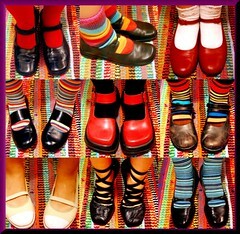 (image My Favorite Shoes by AsleepOnASunbeam, Creative Commons). As CEO of a growing company with a footprint in more than a dozen government agencies and the commercial sector, what I long for most is either more hours in the day to meet with buyers, or more people to help position Information Experts deeper in our existing customers. I am fortunate to have some incredibly talented business development people at Information Experts, who have strong customer relationships that they have built over the years with key decision makers. But to achieve the aggressive growth targets my executive team has outlined, accountability has to spread far beyond the traditional “rainmakers” of the organization. Is your sales strategy antiquated? I personally believe that the process of holding a core group of people responsible for revenue generation to grow an organization is antiquated. Instead, accountability should be pervasive throughout the organization. Yes, there are certain people in the organization who lead this effort, but the mindset within the company should be that everyone has a stake in business development and revenue generation. For example, in Information Experts, we have Practice Leaders for our core practice areas of Education, Human Capital, Strategy, Creative Services, Technology, and overall Government Services. Our Practice Leaders are responsible for driving revenue through their areas. In addition, we have several Project or Program Managers, who are truly the first line of relationship-building with the client. They have a tremendous understanding of both tactical and strategic customer requirements. They are attuned to customer challenges that may be on the horizon. They have gained the customer’s trust. They are emotionally invested in the success of the projects. In addition, we have our entire delivery team, who is instrumental in ensuring customer satisfaction. And we have a sales support team who is there to help with market research, database mining, opportunity tracking, etc. The mindset throughout the entire company is that we are all on the hook to uncover business opportunities, understand customer needs, and deliver customer satisfaction. It’s all interconnected. There is no “sales department” per se. Cogs in a wheel or aware of opportunity? So how does a business owner or executive engage the entire organization in the sales process? Well, this all boils down to culture. Are your employees aware of just how instrumental they are to the growth of the business? Do they see themselves as purely cogs in a wheel, where functions are siloed rather than integrated? Or are they truly interconnected to one another? Adopting a mindset of collaboration, integration, and organizational accountability, where it is communicated that all positions are equally essential to success will go a long way. This philosophy also turns the sales process into a proactive function, rather than a reactive function. Billable resources aren’t simply waiting for assignments. They are out there looking for opportunities. [Your staff members] are, in some aspect, creating their own job security by contributing to a constant revenue stream. When we make hires, we rarely hire for one single position. Hiring for one position usually means we are hiring in response to a specific need – a specific position identified on a specific contract. Sometimes that is all we need. But our overall strategy is to look at the candidates from a holistic, strategic perspective. What can they bring to multiple essential functions – delivery, project management, business development, operations management, executive leadership? Equally important, are they [potential hires] passionate about what they do and about what we do? If they are looking for a single responsibility or to be pigeon-holed, we’re probably not the right place for them. But if they enjoy being a part of organizational success from soup to nuts, and if they enjoy wearing multiple hats, it might work out. Small businesses are by nature very transparent. If an employee isn’t producing or isn’t engaged, you can really feel it. I recognize this business model doesn’t fit every organization. And truthfully, we have evolved into it over time, as we continue to mature and expand our service offerings. However, the ideas of accountability, personal investment, and ownership are universal. The words “it’s not my job” don’t fly in my organization. Do they fly in yours? Small Business Trends and 7 Truths About Accountability (with different parts of the sales process cited). Marissa leads company efforts at Information Experts to create technology-based integrated communications and human capital plus learning strategies for government agencies — as well as for organizations across vertical markets. Check back regularly at Women Grow Business as she shares more on cultivating sales (in any economy); she also can be reached at Twitter, www.Twitter.com/marissalevin. Previous post: Chief Troublemaker Asks: People Are Ready to Follow but Are You Ready to Lead?